Sony VPL-VW500ES review | What Hi-Fi? Every time we test a 4K-capable product such as this, we get more impatient for the 4K Ultra HD bandwagon to gain proper momentum. It’s taken a while, but the signs are finally looking positive, with a fast-growing range of products capable of displaying these high-resolution images. It seems things are moving on the software side too. Sony launched its 4K Video Unlimited streaming service late last year in the US, and Netflix launches its version this year. As with Sony’s first 4K projector, the VW1000ES, the 500ES’s resolution is slightly odd for home cinema: 4096 x 2160 pixels. This makes the aspect ratio 17:9, which means you’ll have black bars with both conventional widescreen and cinemascope. That’s a shame, since full use isn’t made of the resolution available. Take a look inside and you’ll find an SXRD display. SXRD is Sony’s version of LCoS (Liquid Crystal on Silicon) – an alternative to DLP and LCD technologies. Think of it as combining elements of both and you won’t be far wrong. We love 4K. Even with limited amounts of test material, it’s obvious that this technology is a massive advance on traditional Full HD. The difference in resolution is startlingly obvious. Subtle textures such as the grain on one of the beams of a timber-clad building are easy to make out and stay stable even when the camera moves. Colours such as red and green that usually give displays such trouble are vivid, but subtle and natural. The increased detail, and of course the VW500ES’s ability to display it, means that even complex scenes – such as a dense forest or a view of a modern city packed with skyscrapers and moving traffic – are shown with terrific precision. The edges of objects are crisp without looking artificially highlighted (as they do on some other 4K products we’ve seen), and the increase in clarity even improves the apparent depth of images to a point where we wonder if the compromises inherent in 3D are worth it when 2D looks so multi-dimensional. We watch a Blu-ray of Stoker and are pleased by the Sony’s finesse with colours. Skin tones look natural, and difficult-to-reproduce stuff such as grass and trees are handled with skill. We have no issue with contrast either – the projector copes well with scenes that include bright and dark elements in the same frame. In absolute terms, we think the projector could go darker with blacks – certainly our usual reference, the Panasonic PT-AT6000E (£3000), is more surefooted in this respect. The Panasonic also shows up a slight instability with fast motion and the loss of precision with the finest of details. We move to the 3D Blu-ray of Life Of Pi and are taken with this Sony’s skill. It’s pretty convincing, with lots of detail, rich but believable colours and nicely layered 3D. It’s just a shame that Sony doesn’t supply any 3D glasses as standard. Each pair will set you back an extra £50 or so. Buyers are unlikely to watch much standard-definition source material but, given that the display has to make up around 95 per cent of the information seen on the screen, it’s surprising just how decent the results are. The DVD of Scott Pilgrim vs The World was more than watchable, if not entirely enjoyable. 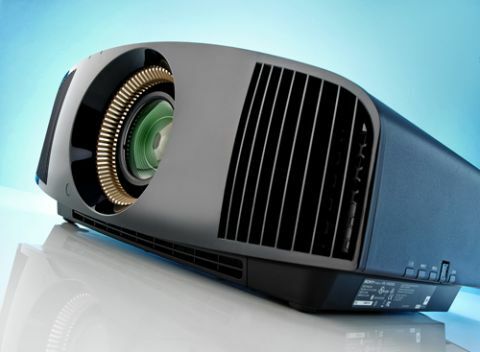 This is a hugely capable projector that is more than able to deliver on the brilliance of Ultra HD. It’s good with Full HD material too. It’s a pricey proposition, but one that points the way to an enticing future. We can’t wait.